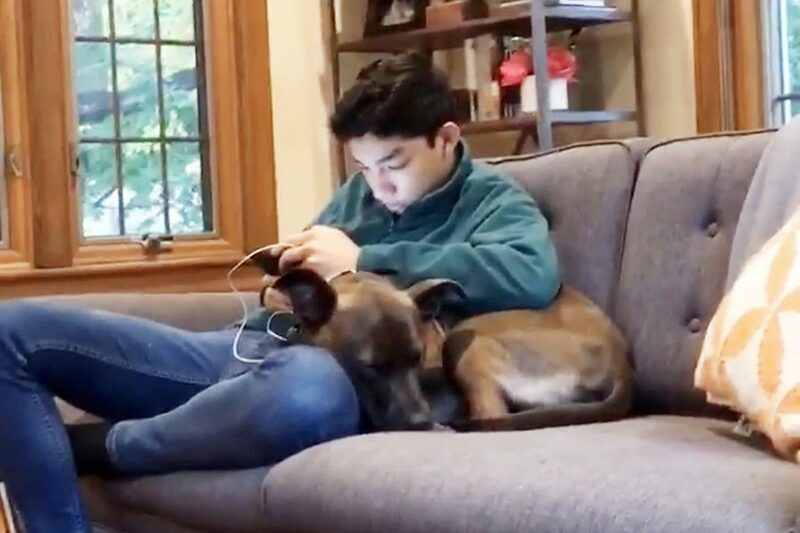 Sloane cozies up to her new best friend, Guatemalan exchange student Julian Argueta. As junior Kate Morris’s eight-week tenure of hosting a Guatemalan exchange student is quickly coming to a close, she reflects on the impact junior Julian Argueta has had on her family. And her dog. But when asked about Sloane, his canine friend, Argueta said, “I wish I could have more time with her. She’s such a nice dog. I’m going miss her.” Julian Argueta, from more than 1,500 miles away, has stayed for the Morris family for five weeks as of mid-November and departs on Dec. 5. Argueta is one of four students that is part of program called Faces & Our Cultures that brings Guatemalan high school students to campus for seven weeks in order for those students to learn more about America and improve their English. While here, they attend classes during the school day and have had the chance to visit historical and tourist sites in Indianapolis, according to Spanish teacher Mrs. Kim Jamell, who coordinates the program. According to information Jamell supplied about the sponsoring organization, the Guatemalan students who participate go through a rigorous selection and interview process in order to participate and must be be enthusiastic about sharing their culture with Americans.